Pictured above is my current collection of Rototiller Model 2 and Model 3 tillers. The one on the right is my original Model 2 that I started out with. It currently has a replacement 5 hp Tecumseh engine and is my "worker" tiller. The second from the right is a 1956 Model 2, s/n 46 23014 that I bought from the grandson of the original owner. His father had taken it apart and repainted the tiller. It has a B&S Model 8 engine, rated a 2 hp. Some cleaning, a carburetor rebuild and a new spark plug wire returned this tiller to good running condition. This tiller has the water pump attachment. It is an Oberdorfer 10.5 GPM all brass gear pump. It could be used to pump a basement or spray trees. The third one from the right is a 1957 Model 3, s/n 47 4044 and was given to me by a gentleman who loves to restore almost anything. It did not have an engine on it when I got it. A few months earlier I purchased another Model 3 with the Briggs Model 9 engine in "well used" condition. I cleaned up the engine, rebuilt the carburetor and installed it on this Model 3. 1957 was the first and possibly only year for the adjustable rear flap which is controlled by the flat piece you see sticking up between the handlebars. This tiller also has lockout pins on the wheels so you can disengage one or both. This tiller is equipped with a 25" reel mower made by the Locke Company. An option on the Model 3 was a tine clutch. Model 3s with this feature will have a rod sticking through the tiller hood (see one in my photo Album). Turning this rod would either engage or disengage the tines. I have also read of some Model 3 tillers having reverse but have not seen this feature on any tillers although I do have information on installing reverse on these machines. The one on the left is my recently restored 1957 Model 2, s/n 27 24086 with a Briggs Model 8B which was Briggs & Stratton's first all aluminum engine. This tiller also has the adjustable rear flap and is equipped with a rotary mower. 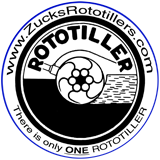 The tiller on the right was my very first Rototiller Model 2. In 1991 a friend gave me this one and a Model T in pieces. The T was in worse shape, so I combined parts and put the 2 together. Two engines came along with the tillers. A 3 hp B&S and a 5 hp Tecumseh, neither one being the correct engine. A friend machined two brass bushings for the tiller gearbox. I used the 3 hp until it started blowing big smoke rings, then put the Tecumseh on. I used this for tilling my flower beds when renovating them. Recently I used it to work in a cubic yard of leaf compost and was amazed at the job it did. Here is my very first Troy Rototiller Model 2 with the correct B&S Model 8 engine. I bought a correct Model 8 in 1998 and after 17 years it is now powering the 1953 Model 2. The engine was in sad shape when I purchased it. It was stuck and the gas tank rusted through. As I took it apart it only got worse. It now has two new valves, new exhaust valve seat, .030" oversize piston, and a good gas tank that I picked up over the years. The Model 2 & 3 tillers were an improvement on the original two-wheeled Model T. Many more attachments were available and conveniently mounted on the "Lightning Change Front". 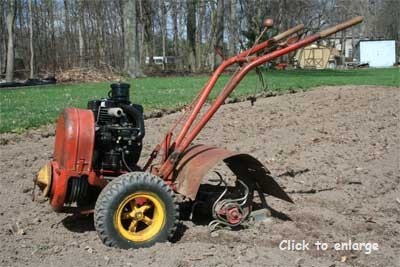 Rototiller was constantly trying to make improvements. Over the years that these were built there were several different worm drives used to result in different tine speeds. I have seen a single lead worm, a 2 lead worm, a 4 lead worm, and a 6 lead worm. Imagine a bolt as a worm. That would be an example of a single lead worm. The more leads, the faster the tiller shaft would turn in relation to wheel speed. Model 2 Parts and Instruction Manual is available on the Technical Information Page.